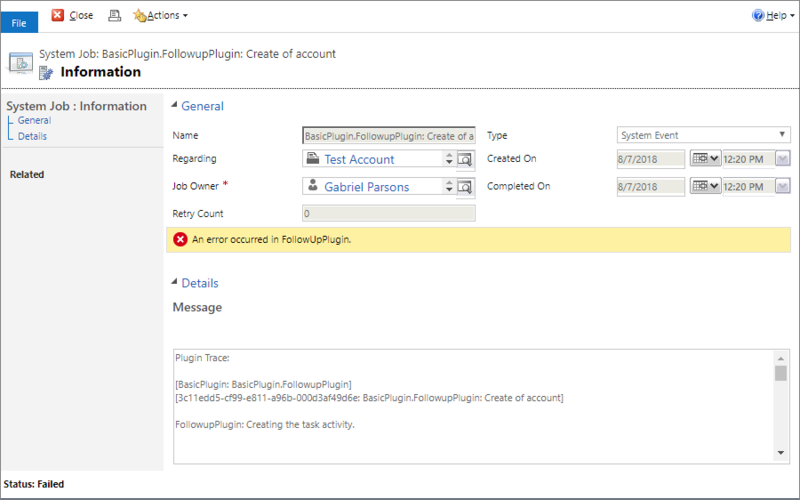 Create an asynchronous plug-in registered on the Create message of the account entity. The plug-in will create a task activity that will remind the creator of the account to follow up one week later. This goal can be easily achieved using a workflow without writing code. We are using this simple example so that we can focus on the process of creating and deploying a plug-in. A model-driven app that includes the account and task entities. If you don't have a model-driven app that includes these, see Build your first model-driven app from scratch for steps to make one in just a few minutes. Download the Plug-in Registration tool. 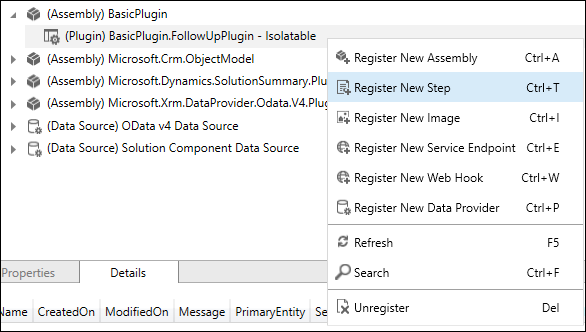 Information about downloading the Plug-in registration tool is at : Download tools from NuGet. That topic includes instructions to use a PowerShell script to download the latest tools from NuGet. You need to use Visual Studio to write a plug-in. Use these steps to write a basic plug-in. Alternately, you can find the complete plug-in solution files here: Sample: Create a basic plug-in. The name used for the project will be the name of the assembly. This tutorial uses the name BasicPlugin. 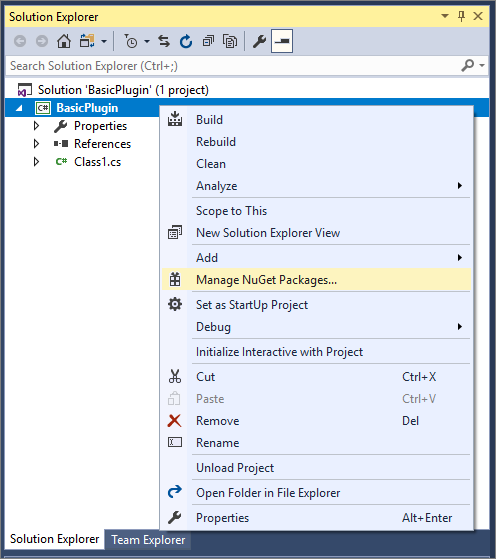 In Solution Explorer, right-click the project and select Manage NuGet Packages… from the context menu. Select Browse and search for Microsoft.CrmSdk.CoreAssemblies and install the latest version. You must select I Accept in the License Acceptance dialog. 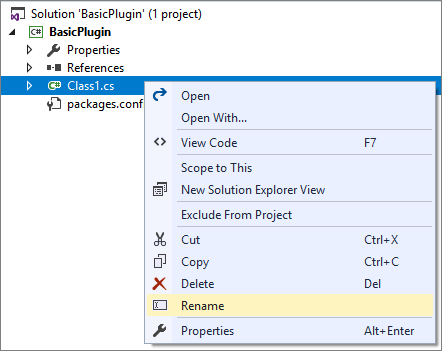 In Solution Explorer, right-click the Class1.cs file and choose Rename in the context menu. Rename the Class1.cs file to FollowupPlugin.cs. When prompted, allow Visual Studio to re-name the class to match the file name. Implement the IPlugin Interface by editing the class. If you just type : IPlugin after the class name, Visual Studio will auto-suggest implementing a stub for the Execute Method. // Plug-in business logic goes here. The IPluginExecutionContext provides access to the context for the event that executed the plugin. More information: Understand the execution context. The code verifies that the context InputParameters includes the expected parameters for the CreateRequest that this plug-in will be registered for. If the Target property is present, the Entity that was passed to the request will be available. The IOrganizationServiceFactory interface provides access to a service variable that implements the IOrganizationService interface which provides the methods you will use to interact with the service to create the task. The plug-in will create a task activity that will remind the creator of the account to follow up one week later. The Id of the account being created is found in the context OutputParameters and set as the regardingobjectid lookup attribute for the task. In Visual Studio, press F6 to build the assembly. Verify that it compiles without error. 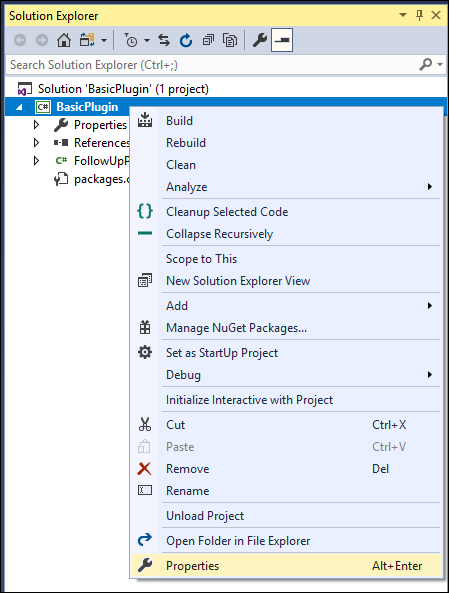 In Solution Explorer, right click the BasicPlugin project and in the context menu select Properties. 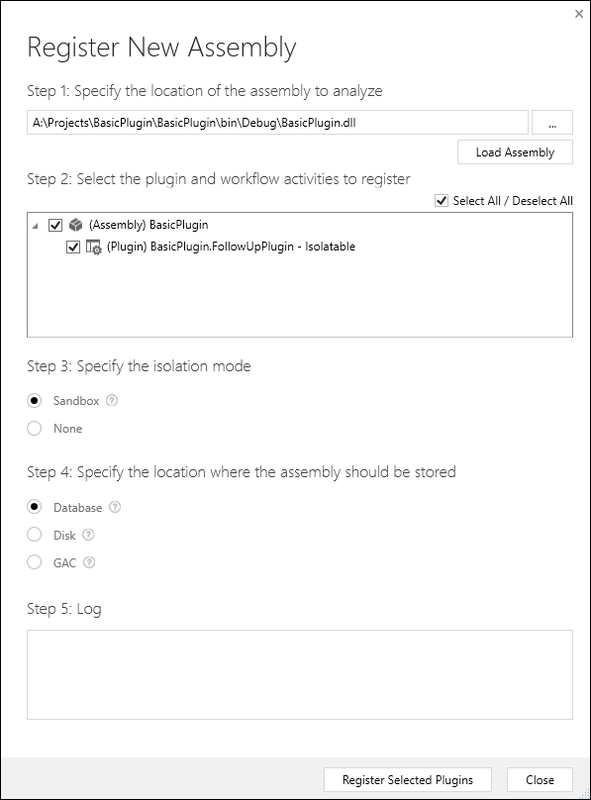 In the project properties, select the Signing tab and select the Sign the assembly checkbox. In the Choose a strong name key file: dropdown, select <New…>. In the Create Strong Name Keydialog, enter a key file name and deselect the Protect my key file with a password checkbox. Click OK to close the Create Strong Name Key dialog. 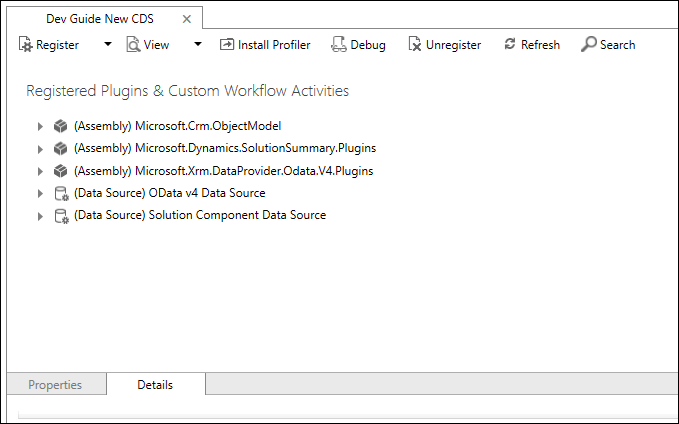 In the project properties Build tab, verify that the Configuration is set to Debug. Press F6 to build the plug-in again. Using windows explorer, find the built plug-in at:\bin\Debug\BasicPlugin.dll. Build the assembly using Debug configuration because you will use the Plug-in profiler to debug it in a later tutorial. 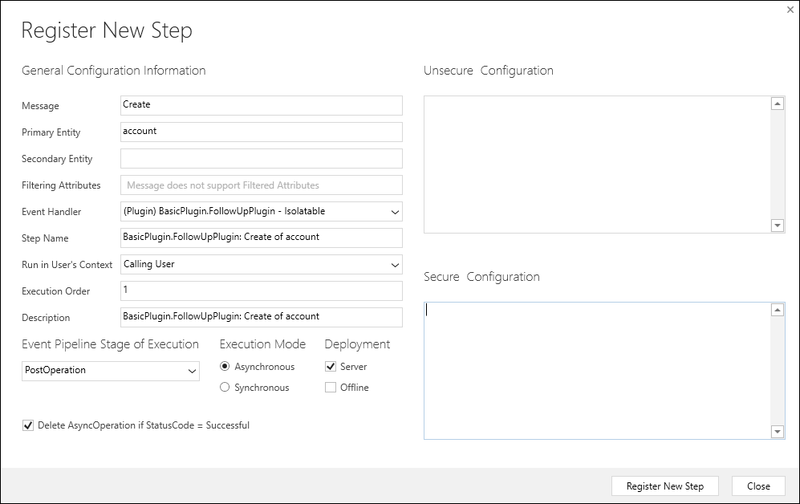 Before you include a plug-in with your solution, you should build it using the release configuration. 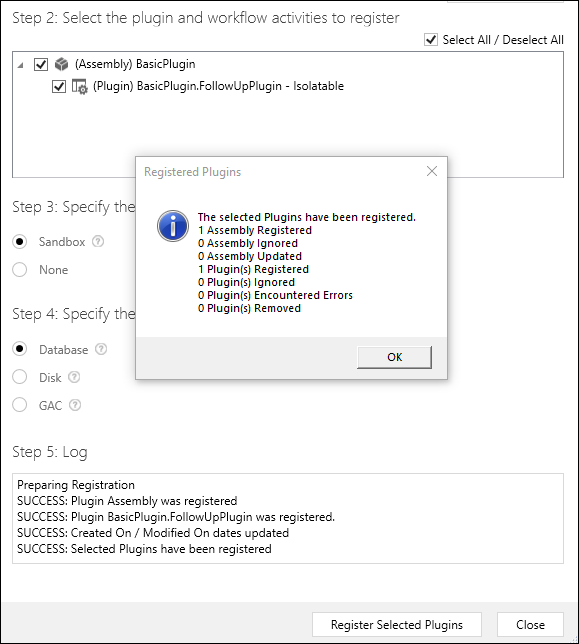 After you have downloaded the Plug-in registration tool, click the PluginRegistration.exe to open it. Click Create new Connection to connect to your instance. Make sure Office 365 is selected. If you are connecting using a Microsoft account other than one you are currently using, click Show Advanced. Enter your credentials and click Login. If your Microsoft Account provides access to multiple environments, you will need to choose an environment. In the Register drop-down, select New Assembly. In the Register New Assembly dialog, select the ellipses (…) button and browse to the assembly you built in the previous step. 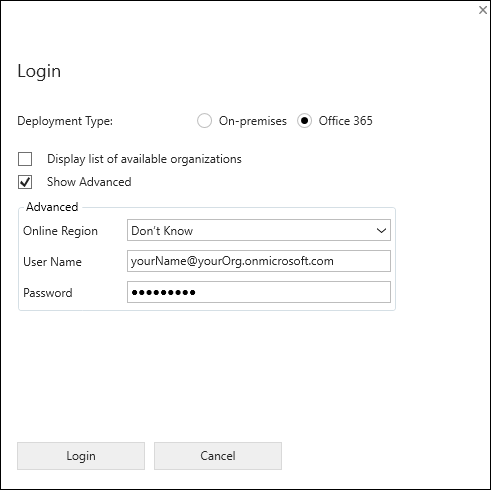 For Office 365 users, verify that the isolation mode is sandbox and the location to store the assembly is Database. 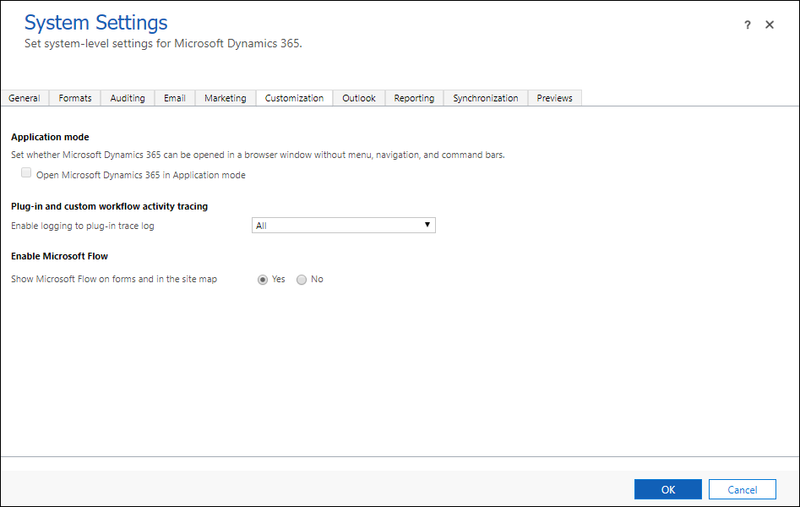 Other options for isolation mode and location apply to on-premises Dynamics 365 deployments. For the location, you can specify the D365 server's database, the server's local storage (disk), or the server's Global Assembly Cache. For more information see Plug-in Storage. You will see a Registered Plug-ins confirmation dialog. Click OK to close the dialog and close the Register New Assembly dialog. You should now see the (Assembly) BasicPlugin assembly which you can expand to view the (Plugin) BasicPlugin.FollowUpPlugin plugin. 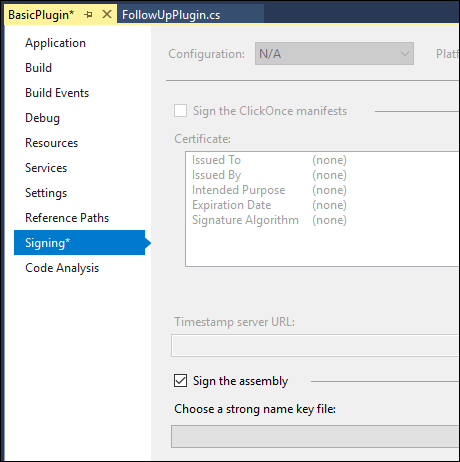 Right-click the (Plugin) BasicPlugin.FollowUpPlugin and select Register New Step. Click Register New Step to complete the registration and close the Register New Step dialog. You can now see the registered step. At this point the assembly and steps are part of the system Default Solution. This is a good time to add them to the unmanaged solution you will distribute. These steps are not included in this tutorial. See Add your assembly to a solution and Add step to solution for more information. 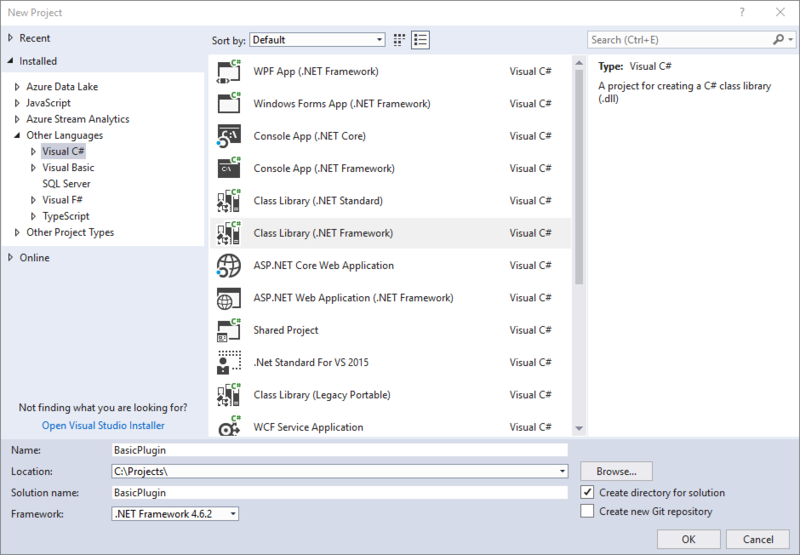 Open a model-driven app and create an account entity. Within a short time, open the account and you can verify the creation of the task. What if the task wasn't created? Because this is an asynchronous plug-in, the operation to create the task occurs after the account is created. Usually, this will happen immediately, but if it doesn't you may still be able to view the system job in the queue waiting to be applied. This step registration used the Delete AsyncOperation if StatusCode = Successful option which is a best practice. This means as soon as the system job completes successfully, you will not be able to view the system job data unless you re-register the plug-in with the Delete AsyncOperation if StatusCode = Successful option unselected. However, if there was an error, you can view the system job to see the error message. 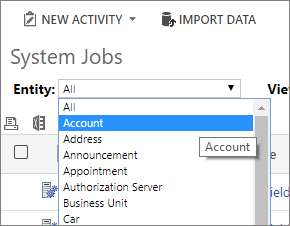 Use the Dynamics 365 --custom app to view system jobs. 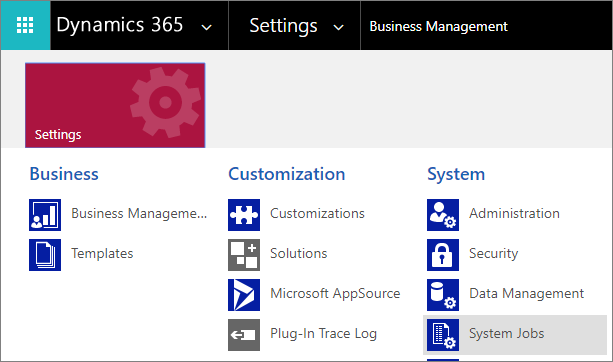 In the Dynamics 365 --custom app, navigate to Settings > System > System Jobs. When viewing system jobs, you can filter by Entity. Select Account. If you open the system job, you can expand the Details section to view the information written to the trace and details about the error. The sample code wrote a message to the trace log. The steps below describe how to view the logs. By default, plug-in trace logs are not enabled. IF you prefer to change this setting in code: This setting is in the Organization Entity PluginTraceLogSetting attribute. Use the following steps to enable them in a model-driven app. 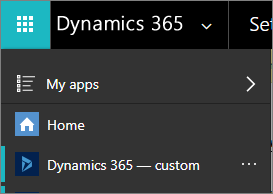 Open the Dynamics 365 - custom app. Navigate to Settings > System > Administration. In Administration, select System Settings. In the System Settings dialog, in the customization tab, set Enable logging to plug-in trace log to All. You should disable logging after you are finished testing your plug-in, or at least set it to Exception rather than All. Click OK to close the System Settings dialog. Repeat the steps to test your plug-in by creating a new account. 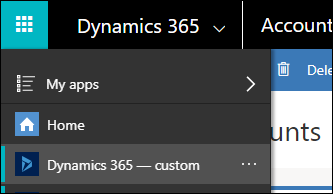 In the Dynamics 365 -- custom app, navigate to Settings > Customization > Plug-In Trace Log. You should find that a new Plug-in Trace Log record has been created. If you open the record you might expect that it would include the information you set in your trace, but it does not. It only verifies that the trace occurred. In this tutorial you have created a simple plug-in and registered it. Complete Tutorial: Debug a plug-in to learn how to debug this plug-in.